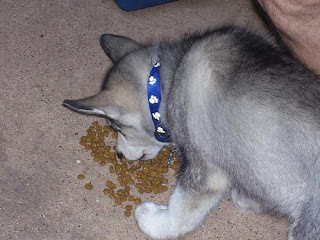 All Things Husky: What Should I Feed My Siberian Husky? Siberian Husky dogs are very high energy dogs. At the same time, they are also a breed that doesn't require (or want) the amount of dog food that other dog breeds eat. This can present a bit of a dilemma to the new Sibe owner. How do I feed my dog what they need when I don't think they are eating enough dog food? When you go to purchase dog food, read the ingredient label. Animal protein will always be the first ingredient in a quality dog food. Since quantity is not an option with the Siberian Husky, we have to go for quality. High energy dog breeds need a better quality of food in order to maintain their weight. It takes a lot of calories to pull sleds over long distances and that trait is burned into the Husky's DNA. We can take them out of the frozen tundra but we can't take the frozen tundra out of them. I feed Sophie Nutro Max Chicken Meal and Rice. This particular dog food provides her with 24% protein, 14% crude fat, 4% crude fiber along with vitamins and minerals that help keep her healthy. Along with treats of boiled eggs and cooked meat pieces, she actually eats enough to maintain her weight and stay healthy. There are other dog foods on the market that will keep your Sibe healthy and help maintain their weight but I have stuck with Nutro because it was what she was being fed by the rescue organization, they recommended it and it works. Right now you can also get a $3.00 off coupon on the Nutro website. The company's breakdown of Nutro Max Chicken Meal and Rice can be seen here. Sometimes getting a Sibe to gain weight seems to be a never ending battle. Sophie was severely underweight when I adopted her in 2005. She weighed 29 pounds when a female Husky of her size should weigh between 45 and 50 pounds. A lot of these dogs do seem to be underweight when they are younger adults. It's really hard to see it because of their thick coats which makes weight management tricky. Every Siberian Husky owner should periodically check their Husky's weight by feeling the dog's ribs. You should be able to detect where the ribs are by running your hand along the dog's rib cage but if you can feel the outline of the ribs and the spine easily, your Husky is more than likely underweight. Feeding a high quality dog food is the first step to getting your Sibe up to normal weight. If they are persistent on refusing to eat dry food, try mixing in a bit of canned dog food to raise the temptation level and the "smell good" factor for the dog. Be careful with canned dog foods and only feed a high quality canned food. These treats are great for training too! The majority of dogs out there are very food motivated and they will choose the real thing over some processed square piece of who knows what anytime. How Often Should I Feed My Siberian Husky? If it is at all possible, leave the food bowl down and keep it filled all of the time. These dogs are generally what I call "grazers." They will take a few bites of food at different times of the day. 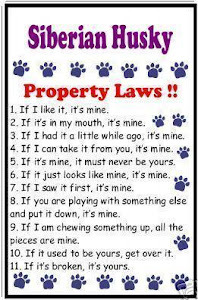 Unfortunately because of small children and other pets, this may not be a possibility for your Sibe. When you can't allow them to graze, break up their feedings into two or even three times per day. This helps the dog have a source of calories to burn over the course of the day instead of their bodies switching over to any fat stored in their bodies, causing them to lose weight. Be sure to join us on our new Facebook page, All Things Siberian Husky, to ask questions and see videos, photos and more information about the Siberian Husky dog breed. i feed boiled chicken foot.but she ate small amout. i worry my pet. So should i feed boiled egg to my husky. Cooked eggs are actualy vey good for Huskies. I make them for Sophie all yhe time & she really likes them! No animal products are good for people or dogs. Raw is the way to go. My vet says it is perfectly safe. Especially since I raise my own chickens and the eggs are fresher than what most people buy at the grocery store. Should I give him only the white part or the whole stuff? I give Sophie the whole egg, white and yellow. I do peel them after they are boiled but I'm not convinced that you would HAVE to do that. Some dogs actually like egg shells and egg shells are high in calcium. Had same problem, start on boiled chicken and rice, then very slow after 4 days wean onto biscuits. This was my vets advice, and worked. Sorry it has taken me a couple of days to respond. Sophie was WAY underweight when I adopted her years ago. Approximately 25 pounds underweight. In my experience with her, putting weight onto a husky takes time. Dog biscuits are NOT going to help you put weight on your husky. Since huskies are a high energy breed, the first thing you need to do is provide your husky with a high protein diet. When you choose the food for the dog, read the ingredient label and if meat (chicken, turkey, beef, lamb) isn't the first ingredient, don't buy that dog food. High protein dog food is more expensive than something like dog chow but it is better for the dog. Once you select a dog food (I actually recommend NUTRO for High Energy Dogs because that's what I feed Sophie and it works) don't change it. Especially if you are dealing with an underweight dog. For snacks and treats, try feeding either whole, peeled boiled eggs or cooked meats like chicken. Don't use processed meats like hot dogs or bologna because of the additives. A lot of processed meats have garlic and other things that just aren't good for dogs. Sophie's coat was thin and straggly when she was underweight but after a few months of feeding her Nutro and cooked meats, it thickened up and looked a LOT better. Hopefully you will get the same results! I'm not a vet, just basing what I am telling you on my experience as a husky owner. I think going to veterinary would be great idea. Yes, the vet is always a good thing. Also, for the digestion, some pumpkin, (canned, but NOT the pie filling!) is very helpful. A tablespoon mixed into his food twice a day will help settle his stomach and help with the other digestive problems. hi guys im from sri lanka.. I recently adopted a Husky-male 07 months and he seems underweight the vet told me he has rickets and hasn't been given enough calcium and vitamins he also doesn't eat much. pls help me out i wanna know how to make a cooked meal for my husky because the dog food brand here are very little. and hey is rickets in dogs reversible? he seems alrght but his hind legs are a bit longer than the front.. I don't know if rickets is reversible in dogs, you would want to consult a veterinarian about that. Siberian Huskies need a high protein diet because they are a high energy breed. They also have a tendency not to eat as much as other breeds which makes their diet extremely important for health. One of the things that you could do to coax the dog to ear more is use a beef or chicken broth in their dog food. Just make sure the broth doesn't contain any garlic or other spices just to be on the safe side. You could also feed the dog cooked meats that are available in your country. Here in the United States it is chicken, beef, pork and venison. Cooked eggs are also another option. You can mix the meat with cooked rice, beans or pasta. No seasoning is needed and it is actually better for the dog if you leave out any salt and feed it to him in the natural state. Hopefully that helped but if you have any other questions, please post them and I'm sure someone will be able to answer or at least point you in the right direction. Pedigree and beneful and all of that type of food that is inexpensive is actually not good for dogs. i work at a petsmart and i have a husky and give him blue wilderness because of his high energy. dogs are like children, all kids like candy and prefer like cocoa puffs over cherios but its our jobs as owners and parents to give them healthy food. so i would recommend blue buffalo first even though it is very pricey. any food that is higher in protein is ideal since if it werent for people, huskies are used to hunting on their own. agian, look at the ingredients and find somethiong high in protein bc huskies have a higher metabolism than most dogs. 1) what can I do to help her adjust to the new surroundings. 2) What signs of stress of anxiety should I look out for in her in order to effectively deal with them so as to ensure her comfortable adjustment. Please remember that I'm not a veterinarian. I will try to answer your questions based on my experience with my Siberian Husky, Sophie. It is possible that the dog food in the United States is not manufactured the same as the dog food in India even though they are the same brand. I am not 100% sure of this though so I messaged them through their Facebook page to try and find out and will let you know as soon as I receive an answer from them. If she is smelling something different in the food, she may not like it anymore or, she could very well be stressed from the move and that is causing the problem. A major move like that can be stressful to any breed of dog. One of the first things that I suggest is making sure the dog's routine remains as close as possible to the way it was before the move. The time difference will be a big shock to the dog's system. Sophie has trouble adjusting to a one hour time difference here twice a year so I can't imagine what it would be like crossing that many time zones. It is kind of like jet lag in a person. The dog's internal clock knows that she should be sleeping right now but it isn't time to go to bed. The time difference adjustment will take time and she will eventually reset her internal clock. How long it takes would just be up to the dog. Another thing that you can do is make sure she has access to all of her old toys, blankets, anything that belonged to her that smells like her, especially her old food and water bowls. Keeping things as familiar as possible will be a big help with the adjustment. One of the big signs of stress in a Sibe is loose stools. Sophie goes through this twice a year when our state changes time by an hour. The dog may pace, pant or become destructive with some things inside the house. Sibes are notorious for even being able to destroy couches when they are stressed. Hopefully she is used to being in a crate when you are not home so destruction of your property doesn't become an issue. These dogs are known for odd eating habits. The weight loss very well could be due to stress. The lamb and eggs mixed in with her food is a fantastic idea and if it is prompting her to eat, I would say keep that up. Please don't try to supplement with dog treats because the majority of commercial dog treats are like potato chips to humans, they are junk food with no real nutritional value. If the weight loss starts to become an issue, you can give her "treats" consisting of single boiled eggs or a piece of cooked meat. You could help take her mind off of the move by giving her treats for doing her "sit, lay down, shake" commands for you. This will also give you some extra time with her which could help with the stress. I can't stress this part enough, if the weight loss gets to the point where it can damage her health, she will need to be seen by a veterinarian. Hopefully this helps! If you have any other questions, please let me know. Can we feed ice creams...? I wouldn't feed ice cream on a regular basis but I do share the occasional ice cream with Sophie but she gets VERY little. I'm always afraid that the dairy and sugar will make her sick. So far so good, she hasn't gotten sick from it. I live in tropical county Indonesia and this is my first husky is 5 months old. What should be ideal weight for 5mo husky? I mean to indicate that he not underweight. I do can feel the ribs,if i purpously press to feel it, but he doesnt look skinny and he has a good thick coat. I feed him origen but just this week i gave up coz its so exp :) so i switch to eukanuba, the thing is different brand give different serving amount, and please corect me if i am wrong, the cheaper DF serving suggestion are more than the exp ones. So actually how much i should my husky? Usually i feed him twice a day and he finish his food in 4 second, he not wven chew it! Is it ok like eat like that? We had two Siberians who both lived to be 15 years old. We always kept them lean and fed them high-quality food and they were very healthy dogs. We just adopted a 2 year old Siberian who is quite overweight. I think she was overfed by her previous owners (who knows what she got for exercise), and was overfed at the animal shelter we adopted her from (when we adopted her, the volunteer said she saw one of the other volunteers give her four cups of food for lunch...). I've got her on a diet (Taste of the Wild salmon kibble, about 2 cups a day--she seems to have plenty of energy) and about 45 minutes of brisk walking per day. My question is--How long will it take her to lose the excess weight? Do Siberians shed pounds quickly or do is take a while? Never had a chubby dog before! A large portion of the internet says that it is very difficult for huskies to lose weight once they've gained it. When I got mine he was 114 lb, and after 3 months of dieting and 60 minutes of exercise a day, he only lost 10 pounds. My Husky is only 9 weeks old, I made the mistake of not knowing what food she had been eating before bringing her home. My chihuahuas eat Beneful (I'll be changing their food as well. ) so when I brought skyler home she ate their food and ever since she has had diarrhea for almost two weeks. She doesn't have parvo, she has her first shots, so I'm assuming it's because of the food, so can I give her the food you are recommending even though she is a 9 week old puppy? Hi, we had a 9 week old puppy with very bad diarrhea too, and the only thing that resolved that was time and patience, with a little common sense! We started feeding her just plain boiled chicken and white rice. Then after a week we introduced (SLOWLY) a bit of kibble - we use Canagan: www.canagan.co.uk : do not know if there are european/us dealers etc. We feed the Salmon variety: www.canagan.co.uk/salmon.html : and all three love it! It has lots of very good vitamins and minerals, and a very high (by shop standards) protein content. After two weeks, she was completely on kibble. Now she is well within her weight limit and very happy, and very energetic! One note: we do feed them all RAW chicken wings and breast meat as a treat (most days). NOTE: Just pointed out to me that two of our dogs had the same condition, and one was sorted through chicken and rice, and the other was ONLY sorted through chicken and OATS - the rolled kind, not the instant 'just add boiling water type'. Eggs,carrots and potatoes are good for your dog. I feed my husky chicken liver, rice, fresh egg and ground beef. I have a 10 week old husky who has very bad diaherra . I have had her first shot dewormed and taken her to the vet where it was said she had a parasite . She was on a antibiotic for 10 days and the diaherra still continues . We had her on blue buffalo wilderness but that seemed to make it a lot worse . We now have her on just pedigree which is what I feed my other small dogs. It seemed to help to where ita not so watery but it's still very soft and very often . HELP! She maybe allergic to soy. My husky is allergic to soy, soy does the same thing to my husky. So I have to be every careful of what is in the dog food when I buy it. My husky is allergic to soy, and I've been trying to find a dog food that doesn't carry soy, does anyone have any best suggestions? Hey Im actually getting a new puppy soon He should be about 8-9weeks when i get him because of money problems i have him on hold. i was just wondering what kind of foodi should feed him. i want to be little bit to his max weight but still healthy and stoutly built. I work at a pet store and they have told me Taste of the wild is really good. but in your opinion what do uou think. he is white with a red/rust secondary color. with icy blue eyes. Yeah, every veterinarian that I went to said not to feed a dog eggs due to the fact that there is a chemical in the whites of the egg that prevent the dog from absorbing Vitamin B, and with the lack of Vitamin B the dog will eventually have organ failure and die. Hi all, i need some help with my husky please. I have a 2year boy. And has a good eating pattern but once he has eaten he sniffs around for more. Weird one what sort off bed do you let your dogs sleep on every single one my boy has eaten.. He bites me until his teeth meet and all my visitors (hence why i have no one visit cause there all scared off him). He has had puppy classes but they disnt seem to help him change i dont know what else to try with him . Ive jus taken on an 8 month old husky boy pup, 5 days in and learning steeply!!! Pab chews any bedding you offer him and is happier on the floor, so we stopped offering and he stopped chewing! we let him up on the bed in the morning for an affectionate cuddle (hes been scruffed by the neck and pushed when he becme too playful once and learned from that) but NOT to sleep, he know his bed is the floor ( he has a wee scratch at the floor and plonks down - perfectly normal behaviour) - their coats are so thick they don't need bedding! My husky always liked to pull the stuffing out of beds she sleeps on comforter just for her on the bottom of one side of my bed. Sometime in the night she just sleeps anywhere on the floor she chooses. She is 60 lbs. Several years ago we had a 100+ lb husky who could weirdly stretch his back legs out behind him, maybe double jointed, so we gave him a human single mattress! My son's husky liked to sleep in the bathtub during hot weather! So funny to see him do that. I was under the impression that Huskies shouldn't have any grains.. My son feeds his dog only Eukanuba and he gets an upset tummy very easy. If he switches the flavor, he gets sick. he is fed as much as he wants although he tend to get up in the night and eat. Are there any homemade treats I can make? my husky is the cuteiest husky i have ever seen ! but there is a little prob. about it , it dosnt bark ever it just make this crying sound and it play with any 1 she sees ? wtf is the prob. with that husky ? can i feed my husky RAW Chicken? someone said cooked chicken, Just cooked in boiled water? or with seasonings? We have two husky pups 11 weeks old. They eat 1/2 a cup of food three times a day and still seem very hungry. Are they eating less than they should? Also I can't get them to stop chewing on our wood furniture and I have given them several other choices of stuff to chew on. What can we do? my 1.5yea\r old husky is sick when she eats "tripe", and has resently started constantly scratching or nipping the leg/body joint and just behind ears, she had an oatmeal bath no change there still scratching I have given her another flea treatment last one was "January" so vet said needed doing. any one got any reason why she like this please help! My 5yr old husky hates any type of dog food & wont touch it unless I mix human food in with it...what can I do to encourage him to eat his dog food? We just got a 10 week old siberian husky. How much food should I start her at? I am picking up my husky. She will be 8 weeks. This is my first pet ever. Found this beautiful husky, she's a baby at heart, guessing she's 2 yrs old maybe, or younger.She doesn't care for dry food, any suggestions on canned or other products? She's healthy,weight is good, looks great, appreciate any help, thanks from Ga.
We have a 10 month old Husky, he is 65 pounds and very healthy. We had him neutered at 6 months old. We've done a lot of research online about our Sib. Husky. He gets 2 walks a day, about 45 mins. to an hour each walk. Plus, playtime in the backyard. We feed ours a brand called Wild Frontier by Nutro, the 1st ingredient is meat (salmon, or venison). We give him about a cup and 3/4 in the morning and then evening as well. Sometimes we give him bits of cooked steak, chicken, or pork. He loves bits of apple(NO SKIN on the apple). Sometimes he likes his food mixed with a little water, and others not. Don't be afraid to call your vet and ask them questions. I would take any dog to the vet if they had diarrhea... There are a lot of websites with great information, do some research.